Summer is here! And that means longer days, summer vacations and road trips. Whether it’s heading out to picnics, day trips or drives across town, we spend a lot of time in the car. Here is a list of summer essentials for the family car to make the best of summer. Read till the end for a great giveaway from Greeniche! Sun Protection – Sun hats and sun screen for everyone! Snacks – Ones that won’t melt or spoil in the heat like energy bars, nuts, chips etc. Bags – Ziplock bags, because they always come in handy, and a few plastic bags for garbage, wet/dirty clothes, throw ups etc. Also some cloth bags to carry things. First aid kit – with bandages, antibacterial ointments, anti-allergies, painkillers etc. Swim suit and slippers – keep swim suits for the kids in the car along with slippers for everyone. You don’t want to miss the chance to enjoy a beautiful river, lake or spray park you come across because you were not prepared. A couple of towels – you never know when you would need those! Chargers – for the phone and all other electronics like tablets, cameras etc plus portable battery charger for the phone. Selfie Stick – because everyone needs to be in the picture, including Mom! Secret Stash – a stash of treats always comes in handy. Keep it for the kids, use it for yourself. Some Important Things (my husband added to this list) – Booster cables, matches/lighter, small shovel, florescent safety jacket, cash and a Frisbee. All purpose wipes – Gentle wipes with natural ingredients to wipe sticky hands and faces, not just for the kids but the whole family. I would like to recommend the Naturalene multi-purpose wipes since they are enriched with herbal extracts for moisturizing and soothing the skin, perfect for the whole family! And I would love for you to win some! Enter the contest below to win one of 10 Naturalene wipes gift boxes delivered right to your home! You will love these wipes! The box contains: a pack of Naturalene Wipes + Cream + Face Cleanser + Lip Balm + Lip Shimmer! Get an entry each by commenting on this blog post, on the Facebook one and on instagram (@urdumom). Share any road trip plans you have for this summer! Increase your chances by maximizing your entries! If you tag a friend on instagram, you get an extra entry for every friend tagged! There will be a random draw on July 19, 2017 and the winners announced. Update: The winner has been announced for this contest. Disclaimer: This blog post is sponsored by Greeniche. All opinions are my own. What are your summer essentials for the family car? hahah! Love that tag line! very catchy! Excellent post!! In one post you covered all the summer essenitals. I am sure people will benefit out it. It will save so much of time and hassel thinking and remembering items. Wipes always come handy especially with kids. Hey Sahar, Thanks for your comment! Glad you think that it will help! Yes, us moms always need wipes! Good list to remember for the road trip this summer as my family plans to travel to BC. Travel pillows are another essential. Also I prefer keeping a couple of big pillows cuz they’re more comfy for a longer sleep in the passenger seat! Keeping bikes is another tip if you wanna take short bike trips on trials. Such lovely ideas!! Pillows and bikes are great additions! Everything essential for a road trip is covered pretty well. We went for a road trip to Vancouver last month and wipes were really helpful. Thanks for your comment! Wishing you a lovely summer!! 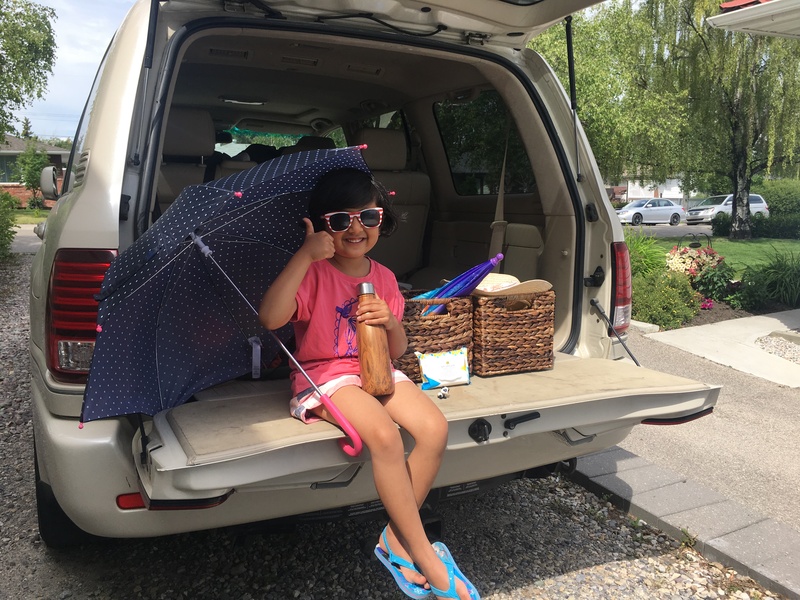 Super complete list for the summer, we have been doing a lot of visits to places that have a water source so the idea of towels and a blanket that can get wet and dry fast is great, I never thought of having a bunch of ziploc bags in the car. Which is brilliant! Lol! What we can ever lack of is wet wipes. Those are absolute life savers! Thanks for your comment! Hope you have a lovely happening summer!